A classic Mexican breakfast recipe gets an update in this smoky, cheesy Huevos Rancheros recipe, garnished with feta, avocado and chorizo. 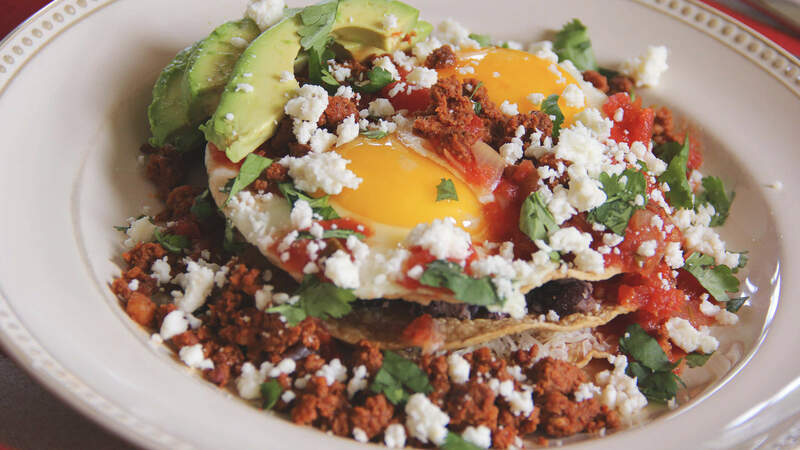 53% of consumers are interested in breakfast offerings with Mexican influences. Corn tortillas, 6-in. --- 36 ea. Eggs, large --- 24 ea. Avocado, sliced --- 3 ea. Brush both sides of tortillas with olive oil. Place on baking pan; bake at 400°F 6 minutes or until crisp. If using canned beans, coarsely mash canned beans with back of fork; some whole beans should be visible. Place one tortilla on each serving plate and top each with 2 Tbsp. shredded mozzarella cheese. Top with a second tortilla. Place 1/2 cup beans on each tortilla. Top beans with third tortilla. Meanwhile, prepare sunny side up eggs. Heat 1 Tbsp. butter in large nonstick skillet over medium-low heat until melted. Gently slide 2 eggs into skillet. Cook 1 to 2 minutes or until whites are set and opaque and yolks begin to firm. Gently remove from skillet; repeat with remaining butter and eggs. Top each tortilla with 2 cooked eggs. Spoon 1/2 cup salsa around the eggs on each of the tortilla stacks. Sprinkle each with 2 Tbsp. crumbled feta cheese and 1 Tbsp. minced cilantro. Spoon equal amounts chorizo that was seasoned with TABASCO® Chipotle Sauce around eggs. Place 3 slices avocado on each plate. Garnish with jalapeños and olives, if desired.